Anatomy of the rotator cuff. 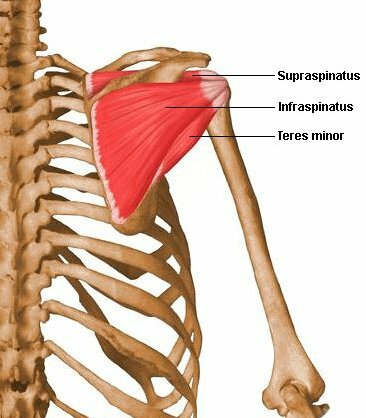 In this view of the shoulder from behind, the supraspinatus, infraspinatus, and teres minor muscles are visible. Image credit: Carol Teitz, University of Washington. The tone of these muscles assists in holding the head of the humerus in the glenoid cavity of the scapula during movements at the shoulder joint. Therefore, they assist in stabilizing the joint. Note that the cuff lies on the anterior, superior, and posterior aspects of the joint. The cuff is deficient inferiorly and this is a site of potential weakness. The rotator cuff may be torn as the result of a fall or repetitive "wear and tear" (caused, for example, by repeated throwing in some sports). A partial tear may cause painful arc syndrome (pain when the arm is lifted in a certain arc away from the body). A complete tear seriously limits the ability to raise the arm and in cases of severe disability, may require surgical repair.